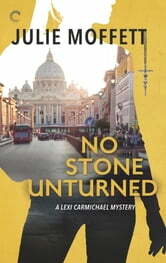 And don’t miss the rest of Julie Moffett’s Lexi Carmichael Mysteries: No One Lives Twice, No One To Trust, No Money Down, No Place Like Rome, No Biz Like Showbiz, No Test for the Wicked, No Woman Left Behind, No Room for Error, No Strings Attached, No Living Soul and No Regrets, available now from Carina Press! Love all Julie’s books and can’t get enough of Lexi and Slash! Another great story! This episode of Lexi Carmichael's life is just as entertaining and riveting as the other 10 books in the series. Most of the story takes place in Italy with great descriptions of churches and dinners! The plot moves quickly with lots of action and interesting characters. Someday, I want to own the entire series in paperback! This ARC book was given to me for free and this is my honest review. That Lexi and her hacking will always cause trouble. Now it’s Rome, Slash, and the Vatican. I’ll follow her anywhere and hope other readers will too. This is a fantastic read. LOVED this book! In this novel, Slash finds his very secret past catching up with him and threatening Lexi. He flies to Italy to delve into who is behind the threats. Lexi, who only knows something is wrong, is left behind in Slash's efforts to protect her. Lexi doesn't like being left behind and immediately jumps in to help him, whether he wants it or not. I found myself totally engrossed in this novel, from the very first page until the very last page. In particular, I loved learning about Slash's past - his real past, not the sanitized version he's told people. While looking into the threats, Lexi finds a way to get herself into more trouble and Slash learns painful truths about his early years. This is a must read for fans of the genre. Each book in the series is better than the one before. This is a stand alone novel, however, you'll enjoy it so much more if you've read the prior books. The series is so good that you really owe it to yourself to read them all. This time we get to read from both Lexi and Slash's points of view, as they travel throughout Italy to uncover the reason they were sent mysterious letters. During their travels, as they speak to a lot of different people, we learn a lot about Slash's past, and Slash also learns some truths himself. Lexi seems to have matured a fair bit, and she really is a stabilising force for Slash in this one. This book was a great read!